In what is being claimed as a victory by few groups, the Supreme Court on Tuesday agreed to reconsider its September 28 verdict allowing entry of women of all ages to Kerala’s Sabarimala temple. The court said it will hear the review petitions in the case on January 22 and there will be no stay of its judgment till such time. Forty-nine entities, including organisations and individuals, have questioned the verdict on temple entry on the grounds that rationality can’t be a yardstick to assess whether a religious practice or belief is integral to the faith of a community or group. The petitions said the SC ruling had other flaws. The petitioners had appealed for an open court hearing saying that will give their lawyers a chance to put forth their arguments before the judges and even respond to queries. Review petitions, as a norm, do not get listed in open courts and are generally dealt with in chambers by the judges who decided the specific matter. The Sabarimala verdict by delivered through a 4:1 majority by a Constitutional bench that included former CJI Dipak Misra, Justices RF Nariman, AM Khanwilkar and DY Chandrachud. Justice Indu Malhotra, the lone dissenting judge, found no fault with the practice of the barring entry of women of menstrual age into the temple. On the fresh petitions challenging the verdict, the SC asked the petitioners to wait till judges decide on the review petitions. “If review petitions are dismissed, your petitions will be taken up. If they are allowed, your petitions will get tagged along,” said CJI Gogoi. Hours after the development in the Supreme Court, the Kerala government called for an all-party meeting on November 15 to discuss the issue. The two-month long annual ‘Mandala Makkaravillakku’ season will start on November 17 and the meeting will also take stock of the arrangements for devotees. 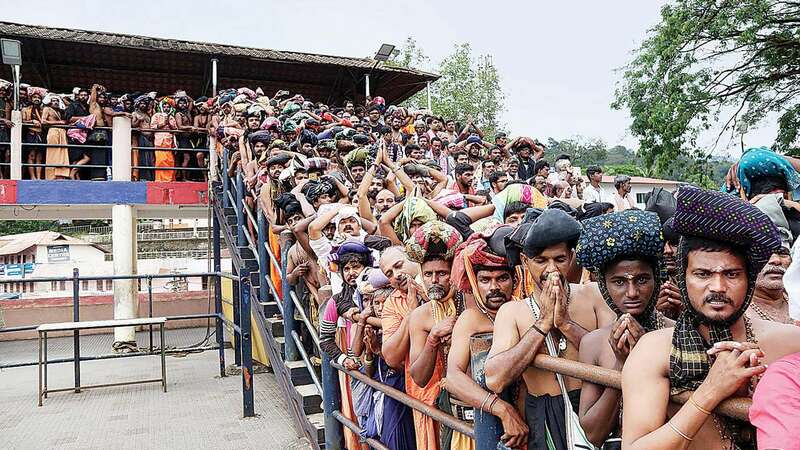 Over 3,700 persons have been arrested so far and 546 cases registered against various people for violence during protests across the state after the top court permitted women of all ages to pray at the Lord Ayyappa temple at Sabarimala.